-- The field 'Attributes' means directory access right, such as "1,1,1,0,1,0,0,0"
-- To execute this lua script, just type in a command "dofile('c:/fromcsv.lua')" with Web Admin's Console. until c ~= '"' -- quote not followed by quote? 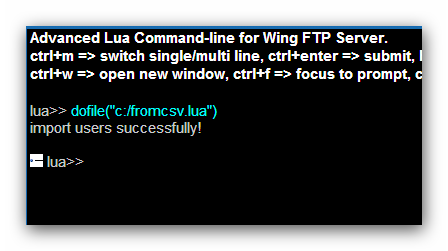 just save the above scripts to a text file "c:/fromcsv.lua", then execute it in the web admin's console. 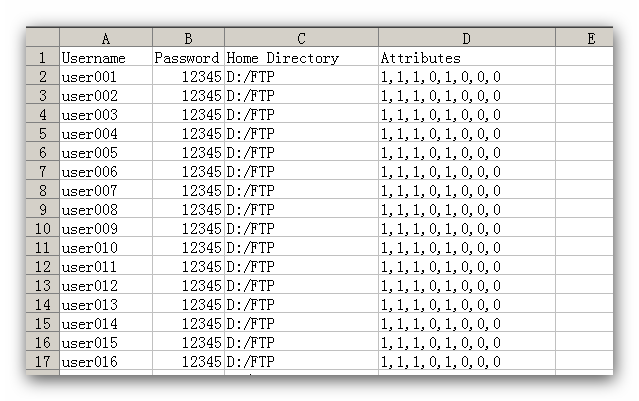 for using this script i want to change Attributes 1,0,0,0,1,0,0,0 column to Group Name ? Just add a new column "Group". how to modify the script to add "Account expiration" and FTPES, FTPS, HTTPS protocols? vitokk wrote: how to modify the script to add "Account expiration" and FTPES, FTPS, HTTPS protocols? Please check the parameters ,  and , all have clear comment.